When I made the asparagus and gruyere tart a while ago I was amazed at how easy it was to work with frozen puff pastry and how great the results were with so little effort. When I made the tart I was eagerly awaiting the start of the strawberry season and I was thinking that a similar sweet version of the tart with strawberries would also be great! While I was waiting for the strawberries I came across a recipe for a strawberry tart on The Hungry Mouse that was just what I was thinking. Now that the strawberries are finally here, the strawberry tart was at the top of the list of things to make. I still had some of the strawberry and rhubarb jam that I had made last year and I thought that the hint of rhubarb would be great on the tart so I went with that for the jam. The strawberry tart was just as easy to make as the asparagus tart and the results were even better. How can you go wrong with a buttery, light and flaky crust topped with slightly roasted strawberries covered in strawberry and rhubarb jam? The only thing missing here is a scoop of melting vanilla ice cream. One thing to watch out for in this recipe is to taste test the strawberry and jam mixture for sweetness ahead of time. If it is a little on the tart side add some sugar to sweeten it up. I am thinking that the next time I make this I might add a layer of cream cheese between the pastry and the strawberries. Roll the puff pastry out into a large rectangle on a lightly floured surface. Score a line around the puff pastry 1/2 inch from the edge. Mix the egg and water and brush over the outside of the score. Mix the strawberries, cardamom and jam in a large bowl. Place the strawberries on the pastry on the inside of the score. Bake in a preheated 400F/200C oven until the pastry is golden brown, about 15-25 minutes. Sprinkle with the chopped pistachios. Oh, my! That looks really, really good. I'm going to have to try that. Strawberry season is in full swing here, so it's just a matter of finding time to bake! Thanks, Kevin! This looks so colorful and bright, using the juicy strawberries in their peak. Love the addition of pistachios for a contrasting saltiness and crunch! This looks awesome! I love strawberry pie and this looks like a really yummy variation. The addition of pistachios sounds delish! This is awsome looking…I'd love to have a huge piece about now as I love strawberries in anything! Oooh amazing idea. We're totally into strawberry season right now!!! So excited about all the delicious (and pretty) things to make!! This looks fantastic! I love pistachios. Love the colors. This is nice to use puff pastry for a tart. Great strawberry tart! Looks delicious. Glad I randomly drop onto your blog. That is one beautiful berry tart!!! The green pistachios really make it POP! Wow, that tart looks delicious! Strawberries taste so good! Just came across your blog for the first time and I loveit! I am making this ASAP. Without a doubt!I'll let you know how it goes! delicious – simple yet always satisfying! I just bought some organic strawberries, and have been thinking quite a bit about making a tart. Yes, this is exactly what I've been looking for! I wouldlove to have the whole tart, looks so summery and so so delicous. Kevin, you are a cruel man…..this tart is calling my name!! Where is the cream!!! What an excellent recipe, Kevin! Simple but with pure & honest flavours! Love the pool of strawberries! Looks absolutely luscious Kevin. Lovely work indeed. ooh la la, another winner!! Looks good, and I like the idea of layer of cream cheese. It would be like a yummy strawberry cheese danish. We are in full strawberry season here and I have them coming out of the ying yang. Love the simplicity of this dish. Looks delish Kevin – and I like the use of the homemade jam and pistachios. This sounds delicious! I haven't used puff pastry much in cooking but you're making me want to. At the farmer's market this weekend I'm definitely picking up some rhubarb to make some jam and then I am totally making this tart! 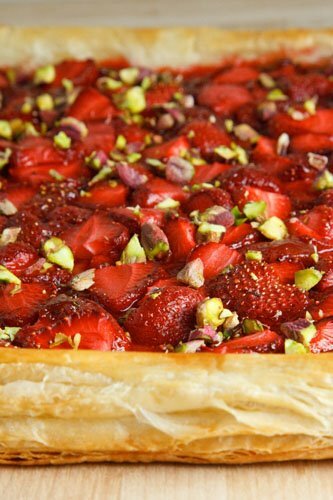 Wow, this tart looks just great…strawberry with pistachio…yummie! As a matter of fact I have in my freezer the puff dough…so I'll definitely try this one. Nice pictures! Fabulous strawberry tart! I love the addition of pistachios! I am so loving the strawberry season and your tart is absolutely beautiful Kevin. The colours are so vibrant and appealing. What a gorgeous tart! It looks beautifully rustic and so French! Well done! This looks awesome and I'm already imagining sinking my teeth into the pastry and strawberries. YUM has to be word! you make fascinating looking foods! YUM! What a fresh sounding and beautiful looking dessert! I love it! I love simple desserts. I will have to get some strawberries to try this out! Looks divine. I love strawberries and pistachios. I just might try this recipe. I've used puff pastry before too, its like it does all the work for you! I love your recipe Kevin. I've never made anything like that before, now I will. This is going to add another few pounds, I'm sad to say!! And, if you add the cream cheese layer, of course it will be even more dangerous!! The mighty strawberry! Looks great Kevin. I am excited to see your upcoming strawberry creations! Wow!!! That is gorgeous! Stunning – a perfect summer treat! simply gorgeous! the color and flavor look so delicious. yay for strawberry season! This looks fabulous. I love all the strawberries on your blog lately! A strawberry vol au vent. Now that would make a good breakfast. Wow – now that's what I call a strawberry tart! Looks delish! SO pretty! I think my favorite thing about it are pistachios. Kevin, that 1st pic left me with my jaw dropping…I'm salivating. Such a lovely tart Kevin! Puff pastry is one of my favorite thing to make. I find it very therapeutic! LOVE puff pastry, it's dangerous for me to be around. This tart looks de-lish! Beautiful tart! I bet it tastes delicious. The pistachios on top would add a nice little touch! I am making some puff pastry right now. Its super easy but a long process. I cant wait to start using it… like for something like this. Nothing like fresh fruit tarts in the sumemr! I like the contrasting color here with the pistachios and strawberries – gorgeous! I made this on Saturday! You know how you bookmark things and think you'll get round to them. I just did it. Helps that it's dead easy of course! Lovely photo. Love the unexpected use of pistachios.